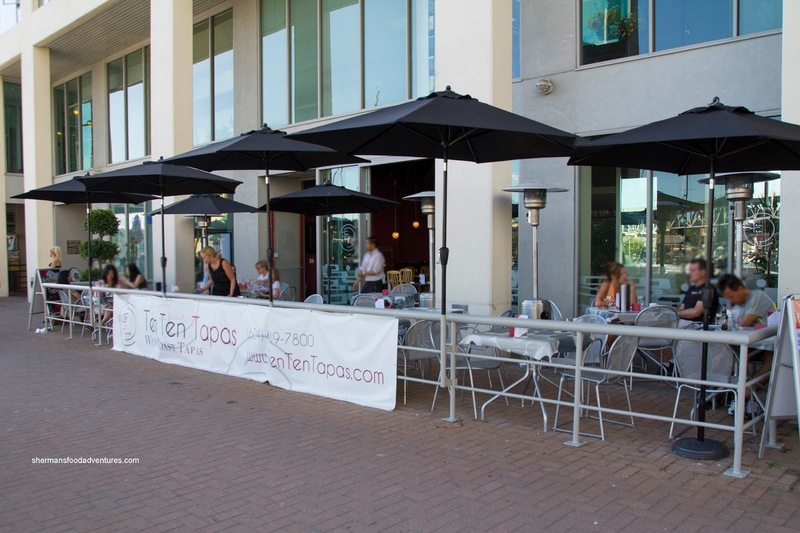 My last visit to Ten Ten Tapas was when it first opened in 2013. I remember feasting on an array of dishes that ranged from really good to a bit confusing. Some of the dishes featured too many of the same sauces and garnishes. Since then, there has been a change of ownership and head chef. 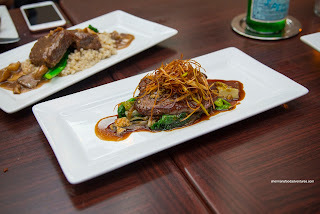 Now featuring a simpler menu that sports more classic dishes, I found myself being invited for a tasting thanks to Tangoo. Naturally, I needed an able eating companion and Emily fit the bill nicely. We kicked off things with the Sea-2-Sky Beet Salad. Unlike many of the cookie-cutter beet salads in town, this one featured white balsamic pickled beets. 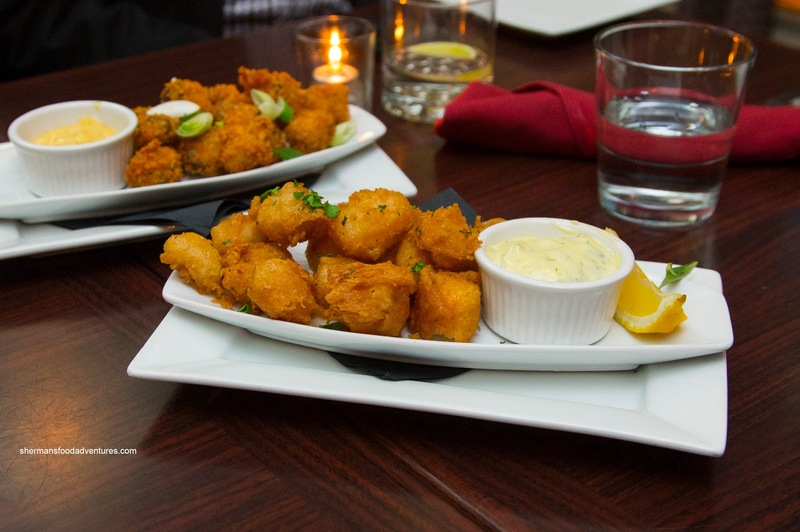 Suffice to say, there was a elevated tartness that brought the dish alive. 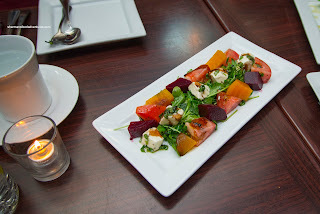 I liked the firmness of the beets which contrasted the soft vine-ripened tomatoes and fresh mozzarella. The whole thing was finished off with baby greens and mint with a balsamic reduction. 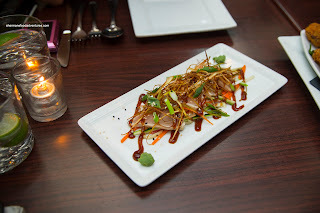 Looking a bit cluttered, the Pan-Seared and Sesame-Crusted Albacore Tuna was more firm than buttery. It was prepared appealingly rare and was garnished with Asian slaw, sesame seeds and crispy leeks topped with a citrus ponzu glaze (and wasabi on the side). For me, the tuna was fine on its own without the mess of other ingredients. Onto 2 dishes in a golden shade of brown, we sampled the Fried Pork Bites first. These were coated with panko and fried until super crispy. They weren't greasy at all though. I thought the pork was super tender and succulent, yet a bit underseasoned. If the dip on the side was spicy or had more impactful flavours, this dish could've been better. However, there was no issue with the awesome Fish Poppers. As simple as this dish was, it was one of my favourites. Each nugget was crispy and light where there was just enough saltiness. As for the fish, it remained flaky and moist. 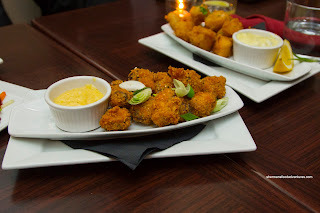 Even the house-made tartar sauce was on point being creamy with the right balance of onion and pickles. With probably a tie as the best dish of the night was the Cajun Pan-Seared Calamari with mango chickpea salsa & house made tzatziki. 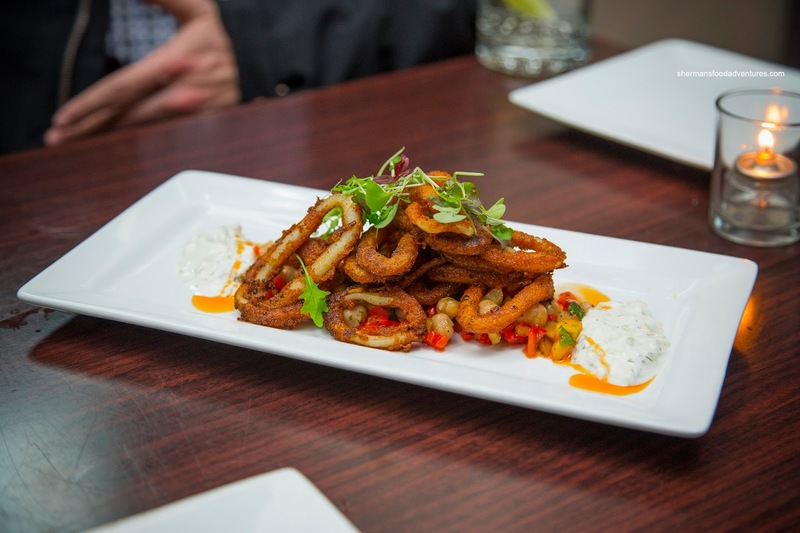 These tender rings of squid were lightly battered and crispy with a noted spiciness. However, the flavour profile was more than that as there as a depth-of-flavour which hit all of the notes. Heck, it didn't even need the tzatziki. With that being said, the cooling effect of the yogurt did help balance things off. 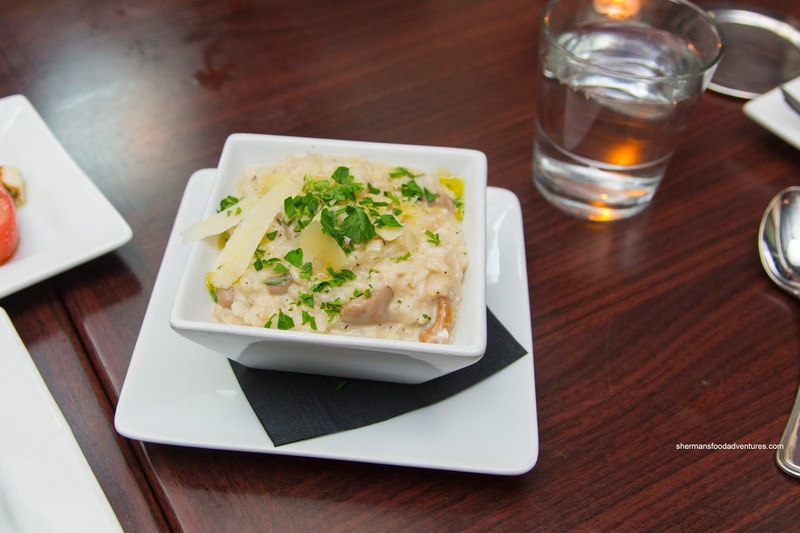 A touch clumpy, yet still creamy, the Wild Mushroom Risotto featured wild assorted mushrooms, fresh herbs & Grana Padano cheese. I thought the rice itself was fine being chewy. However, there might've been too much truffle oil for my liking. Despite that, there was a good amount of mushrooms and cheese for a full flavoured risotto. 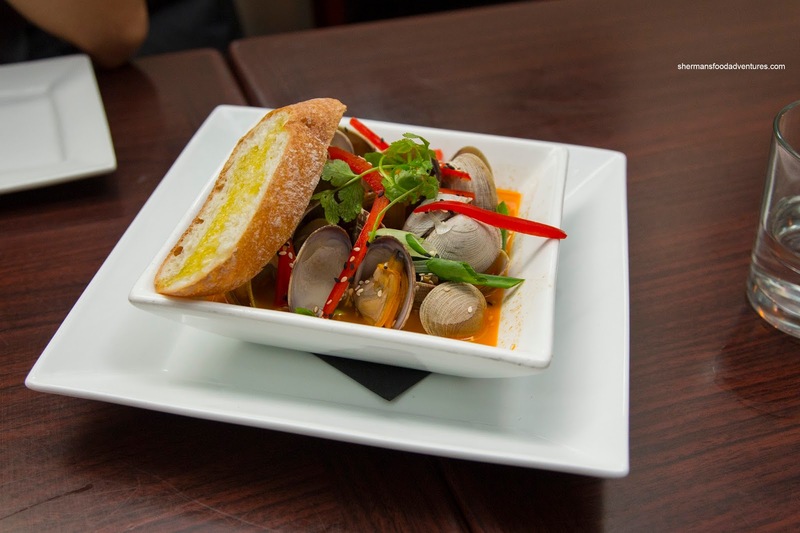 Onto some shellfish, we had the Coconut Curry Local Savory Clams. These large and meaty clams were a touch chewy, but briny and sweet throughout. We really enjoyed the Thai curry broth as it was spicy and aromatic while properly seasoned. It was refreshing to see a Thai curry broth that was not all coconut milk. The dish was garnished with cilantro, green onions and red pepper. 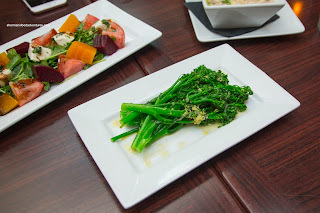 We were presented with a simple plate of Broccolini in citrus butter next. Was it a hint that we needed veggies in our diet? 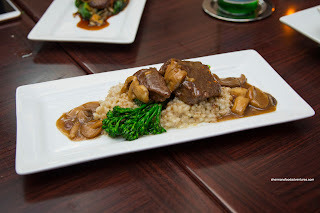 Well, it was a good thing though as it was an interlude of sorts before some heavier dishes. The broccolini was crunchy and vibrant sporting just enough seasoning for effect without taking over the flavour profile. As if we needed anymore food at this point, 2 meat dishes arrived. We sampled the Slow-Braised Beef Short Rib first and found that one piece was more tender than the other. This was probably due to one piece being fattier. For the more tender one, it featured a gelatinous bite that was completely moist. Flavours were a bit mild though, but the mushrooms were woodsy. Underneath, the herb barley risotto was good being firm with just enough moisture. Somehow, the citrus butter from the broccolini was the most noticeable flavour. Next, we had the Tenderloin Medallion atop a bed of braised romaine lettuce and crispy leeks, finished with a red wine demi-glace & crumbled blue cheese. Prepared medium-rare, the tenderloin wasn't as buttery as we would've liked, but it was seasoned well. Furthermore, the pungent blue cheese was quite evident where it helped flavour the entire dish. Of course for Emily, this wasn't enough (is she the new Mijune? 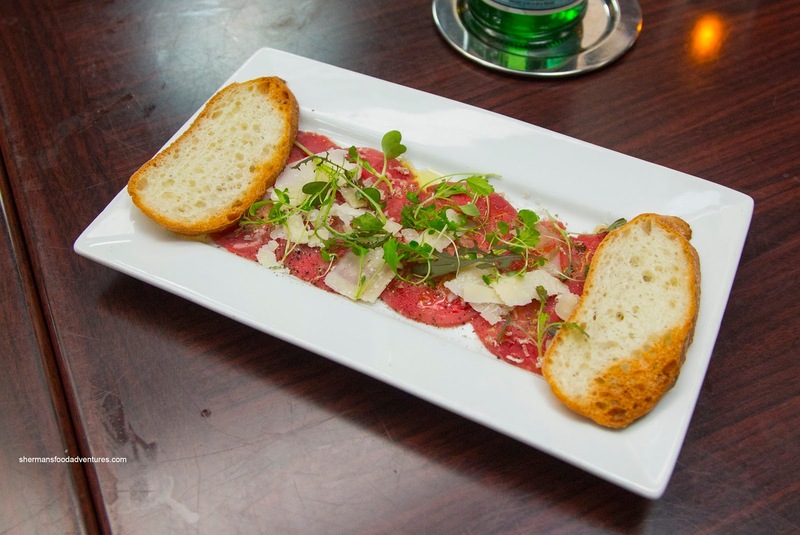 ), so we got the Beef Tenderloin Carpaccio as well. We found the meat to be buttery soft, yet a bit hard to remove from the plate as it broke apart fairly easily. Flavours were all there including Earthiness from the truffle oil (just enough) and the saltiness from the Parm as well as some fresh horseradish to add a kick. 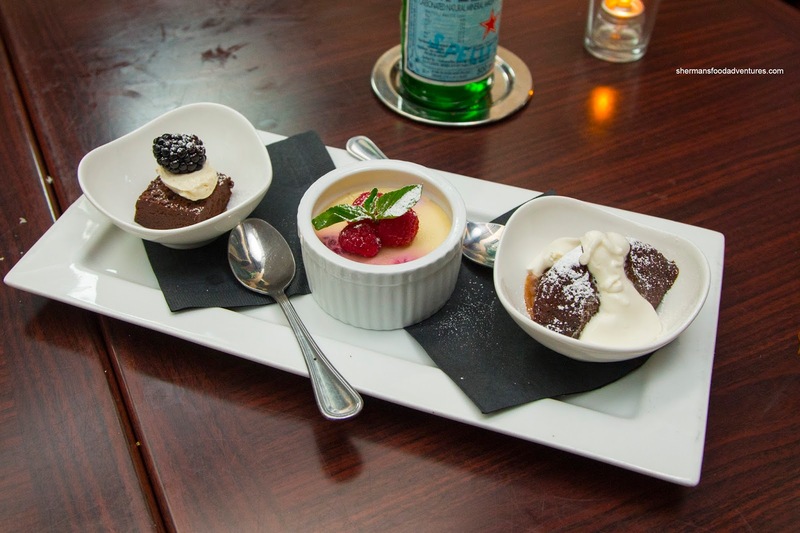 Onto dessert, we were served a trio that included (from left-to-right) Dark Chocolate Torte, Raspberry Panna Cotta and Sticky Toffee Pudding. Surprisingly, all 3 were pretty good. The torte was chocolaty and rich topped with a semi-sweet maple marscapone. Although the panna cotta was more like a white chocolate custard, it worked being just sweet enough. Finally, the sticky toffee pudding was actually light and fluffy while easy on the sweetness even with the caramel rum sauce. This was a fitting end to a relatively solid meal. Sure, there were a few issues here and there, but overall it was above-average, especially considering the reasonable-pricing.